For those of you who use WhatsApp for your voice and messaging needs, backup up those chats is going to be a lot easier in the coming weeks. 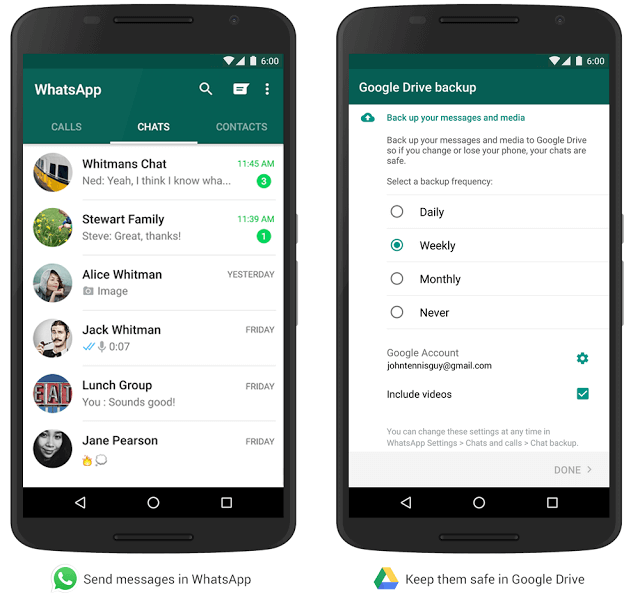 Google announced that an update to WhatsApp is going to allow users to back up their content to their Google Drive account, making sure those important chats, messages, videos and images shared on the app are not lost. The update is rolling out over the course of the next few weeks so if you don’t see the option in your WhatsApp settings, it will be there soon. daily, weekly or monthly cadence depending on your needs. Moreover, should you need to restore your content, it can be done through the app with just a few taps. This new backup feature will be welcome for users who want to make sure they do not lose any content should they lose their phone or upgrade their devices. In the post on the Google Drive blog, the update to the app to allow this backup feature will be rolling out in the coming months, giving me the impression that both companies are going to ease into it a bit before unleashing it to the masses. WhatsApp is a free app and the first year of service is free as well. After that it is just .99 Cents per year to use.